"There are some novels that take you by the hand with their lovely prose alone; there are those that pull you in with sensual renderings of time and place and a compelling story; and there are still others that seduce you solely with their subject matter. But it is a rare novel indeed that does all of the above at once and with complete artistic mastery. 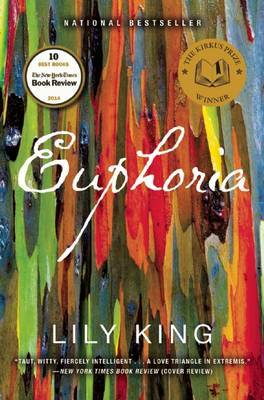 Yet this is precisely what Lily King has done in her stunningly passionate and gorgeously written Euphoria. It is simply one of the finest novels I've read in years, and it puts Lily King firmly in the top rank of our most accomplished novelists." "Fresh, brilliantly structured, and fully imagined, this novel radically transforms a story we might have known, as outsiders--but now experience, though Lily King's great gifts, as if we'd lived it."